Webinars are one of the most powerful forms of content as they have a high conversion rate. Adobe found that their webinar landing pages converted to registrations at 51% and that 19% of webinar attendees converted by joining a demo they offered at the end. But people won’t automatically flock to your webinars, just because you created them. To get webinar attendees you need to spend an ample amount of time to promote it. One of the best ways to do this is with social media. For promoting a webinar, the basic thing you need is a landing page. The better a webinar landing page is set, the higher your conversion rate will be. 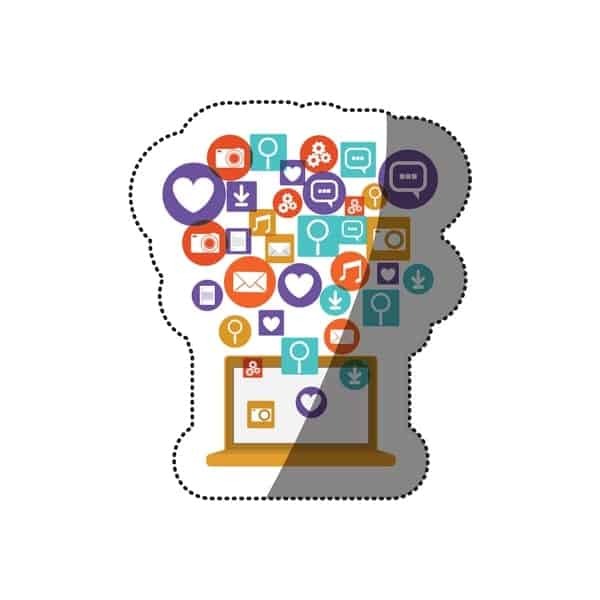 In addition to optimizing it for conversion, you should also optimize it for social sharing. This is because you want the visitors you send to that page to share it with their followers. It will send in even more traffic. The simplest way to optimize your landing page for sharing is by adding share buttons. Share buttons can increase the number of shares a page gets by almost 7 times. Another added benefit of share buttons is that they can increase social proof, especially if your webinar landing page gets shared a lot. If you display the share counts, landing page visitors will be able to see that there’s something special about the webinar. Hence, they will want to attend it too. So, add some share buttons and turn on the share counts. But don’t add too many of them. Limit the number to 2 or 4. It’s better to focus on a few social networks that drive the most traffic. Here’s an example of a webinar landing page with share buttons from Hootsuite. As you can see they have only displayed sharing buttons for Twitter, Facebook, Google+ and Linkedin. The share buttons you add to your landing page should depend upon the social networks that drove the highest traffic in your past webinars. It could also depend on the social networks you are driving traffic with for this webinar. Every time a visitor clicks on these share button you should want the perfect social media post to appear. The better your posts look, the better they will perform individually and drive traffic back to your landing page. So, pre-write the text for the updates and make sure images are attached to these updates as visuals can increase engagement. Another page you can add share buttons to is the thank you page. The thank you page is the page people are redirected to after they sign up for the webinar. Then place big share buttons below the message. When they click on the share buttons here make sure the link to the webinar landing page is shared instead of the thank you page. A tool you can use to set up shareable, high converting webinar landing pages and thank you pages is ClickMeeting. They offer templates using which you can set up landing pages quickly. And they can be optimized by the addition of share buttons and other items. Using ClickMeeting you can also run the webinar itself. It saves you the hassle of using different tools for different tasks and connecting all of them together. This landing page should be set up 2 to 3 weeks before the day of the webinar as it allows ample time for promotion. For Facebook, you should share two types of updates. One is the link post with the large thumbnail and the other is photo posts. Sharing short videos can help too. In link posts, the title of the webinar should be added as overlay text to the thumbnail image. 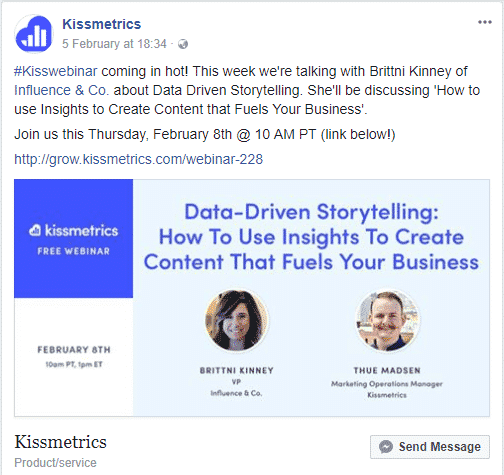 You can also add the names of the hosts and time at which the webinar is taking place like KISSmetrics does. You can add the rest of the details in the description. For photo posts, you can create a similar larger sized image or you can share a photo from your personal life and write the story behind it and tie it with the webinar’s content. Be careful with the number of times you publish these updates. Limit them to a maximum of 5. For Pinterest, you should create portrait shaped images. Here too you should include the title of the webinar as overlay text on the image. Then schedule it on Pinterest to reach Pinterest followers at optimal times. On Pinterest, you can feel free to share it several times on both your boards and on group boards. On Twitter, you should create both text and photo tweets and schedule them to go out at several times a day. Write several different version of tweets and figure out which version drives the highest engagement and clicks. You can schedule the best-performing ones to go out more often later. On Linkedin, you can create updates that are similar to those on Facebook and schedule them to go out on your profile, Linkedin page, and groups. Instagram is mainly about visual appeal. So first create a good image. Start out by finding some good Instagram optimized background images. Then use an editor and add your webinar title and other information like time, host(s) name, etc. After that write a caption that explains more about what people can learn in the webinar. End it with a call to action on how to sign up for it. 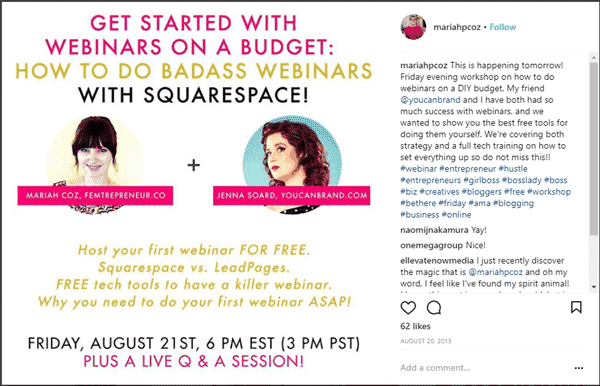 Here’s an example of an Instagram post promoting a webinar from Mariah Coz. As you can see Mariah has included the title of the webinar, the names of the hosts, details on what will be covered and the date and time. After you schedule your organic updates to do go out at optimal times, you can begin creating some ads. The best social media for creating ads is Facebook. It has over 2 billion monthly active users. So, you should be able to reach people who are interested in almost any topic. There are mainly two types of ads you should create, warm ads and cold ads. Warm ads are ads you display only to people who are already familiar with your work. You will set these ads to retarget people who are on your email list and those who visited your website recently (you can track them using the Facebook tracking pixel). You can also target people who like your page with these ads. As you will be targeting people who are familiar with your work you should brand the ads with personal details. 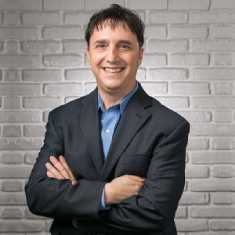 For example, if your webinar is being hosted by someone prominent in your company these people will recognize you can use their photo in the ad image along with the title of the webinar. Cold ads are ads you create for people who have never heard of you. You reach these people by using Facebook’s targeting settings. While creating these ads you should avoid any sort of personalization and only add the title of the webinar or something relevant to it to the ad image. You can also use a design here that is similar to the landing page to ensure there is good conversion scent. Another great platform for promoting B2B webinars is Linkedin. You can also promote your webinar by reaching out to influencers and asking them to share your webinar with their followers. To make it easy for them to share, you can pre-write the social media messages and just embed the share button within the email. To sweeten the deal for influencers you can create an affiliate program and give a portion of the profits generated when an attendee referred by them purchases the product promoted at the end of the webinar. A tool that makes it easy to find and reach influencers is Ninja Outreach. These are all the different methods you can use to promote a webinar with social media. Start off by creating a landing page that is optimized for both conversions and social sharing. Accompany it with a thank you page that is optimized for social sharing as well. Once these two pages are set up you can promote it on social media through organic methods and Facebook ads. Another method you should definitely try out is influencer outreach. How do you promote webinars with social media? Which techniques work best for you? Please leave your comments below. Thank you very much for these tips. I have added the social sharing to my blog.